Republican Gov. Mary Fallin isn’t generally known for possessing brilliant oratory skills or known for making witty and resonating off-the-cuff remarks to the press, but that held true for her Democratic predecessor Gov. Brad Henry. Maybe a majority of Oklahoman voters just don’t trust slick talkers. Certainly, there’s a lot of distrust here for President Barack Obama, one of the best orators ever elected to political office. The use of soaring rhetoric and ironic, witty retorts, the result of intellectual insight and practice, must be an anathema to the down-home spinners here. 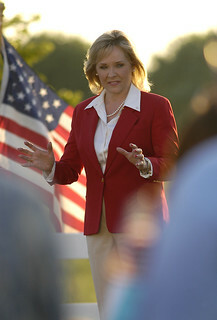 Given all that, it didn’t surprise me in the least that Fallin supposedly fumbled her way verbally through an attempt to defend the Ten Commandments monument, which still stands on state Capitol grounds despite the recent 7-2 Oklahoma Supreme Court ruling that it must be removed. You know, there are three branches of our government. You have the Supreme Court, the legislative branch and the people, the people and their ability to vote. So I’m hoping that we can address this issue in the legislative session and let the people of Oklahoma decide. I’m not the first to point this out, but the so-called gaffe (or, really, was it a gaffe?) is far less important than a governor openly ignoring a court ruling so people can decide to impose their religious beliefs on other people. The judicial branch of government was established, among other things, to prevent such occurrences. The rule of law prevents the rule of mob and tyranny over minorities. At this point, I’ve written about this section and the ruling so much I’m losing some interest in its legal and historical specifics. Here’s my last post on the issue. Here’s the one before that. The court’s ruling, it should be noted, is not at all controversial in any legal sense. Read the section. Note that the Ten Commandments monument is currently on public property. What everyone should be concerned with, however, is that Fallin has NOT ordered the monument removed and is acting defiantly against the basic rule of law. Even if Oklahoma voters eventually vote to repeal the section, which is a reasonable expectation, then the monument should be removed until they do so. Oklahoma Attorney General Scott Pruitt has essentially asked the court to reconsider the decision, but the 7 to 2 vote represents a solid majority. Both Fallin and Pruitt probably also know, along with their three branches of government, that there’s still constitutional arguments to be made on the state level against the public location of the monument beyond the use of Article 2, Section 5, or at least I think so. There’s also the federal court system as well, the overall issue of the separation of church and state and the First Amendment. It’s highly unlikely the American Civil Liberties Union will give up on the case if the state constitutional section is repealed. This case is going to go on. I have a deep appreciation for the historical civil disobedience practiced peacefully by Dr. Martin Luther King and his followers during the civil rights movement, but the Ten Commandments monument case doesn’t begin to rise to this level. The vast majority of people in Oklahoma have broad access to the Ten Commandments. It’s in the Bible. It can be found on the Internet. Study it. Promote it. Talk about it in Sunday School classes. The monument’s public location isn’t a matter of a violation of rights or an action for equality, precepts guaranteed by the U.S. Constitution. The monument is a stone with some words on it put up in 2012 and paid for by the family of state Rep. Mike Ritze, a Republican from Broken Arrow and a Southern Baptist ordained deacon and Sunday School teacher. Put up the monument on some private property. Allow people to view it. I would bet most people against the monument’s public location wouldn’t mind or care. I certainly wouldn’t care. But Fallin should comply with the court ruling and get it off state property. The lesson taught here is not that our governor doesn’t even know the three branches of government, which she most likely does, but that it’s okay to ignore the rule of law and the judicial branch of government. Ignoring the rule of law in this case is not heroic civil disobedience. This is about publicly privileging Judeo-Christian religious edicts above other religions and people without religious affiliations. It’s a clear violation of the separation of church and state.